"Could be the tiniest thing Sony has ever made"
Sony's finally getting on board with the wave of fitness technology – but taking it to an all new level. 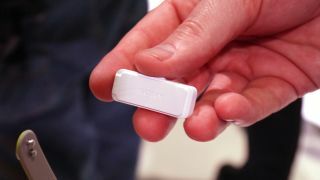 The Core is a small chip, able to be worn in a variety of ways, that is tiny enough to slip into the Smartband that Sony is launching to carry it around initially. Update: Sony has confirmed to TechRadar that the Core won't be available to iOS users at launch, and that it's 'focused' on Android for the time being. Instead of just tracking your daily steps, this new technology will be able to tell you how long you were walking, running, sleeping and travelling. But on top of that, the new LifeLog application will give information on when you took pictures, where you took them, what music you were listening to and all the other entertainment you consume, meaning you can "watch your lifestyle played back to you on screen," according to Sony Mobile CEO Kuni Suzuki. Sony is working with developers to create 'new innovation' for an open partnership to spread out the data, as well as launching new hardware that will complement the SmartBand. Sony clearly has some development to do on this little device, but wants to get it out in the open to show it's active in the area, with Suzuki claiming the brand will give more information in the near future – it probably already knows where you will be.